The finance world can be rather confusing with all of its different terms if you are not a professional in the field. With different types of retirement plans, advantages and disadvantages for each and fees associated with every type, one can easily decide to brush off the importance of learning the basics. There are many benefits, for example, in understanding how a 401k rollover to annuity is beneficial for you. Now if I go back and read this last sentence, I feel as though I am already overloading you with words you may be unfamiliar with. We will cover the magic of a 401k rollover to annuity and the benefits of considering this option with your financial advisor. Let’s start with understanding what a 401k is. A 401k is a savings plan that is geared towards the workplace and its employees. It allows employees to invest a portion of their paycheck before taxes are taken out. This savings then grows tax-free until retirement age and its withdrawals are taxed as income. Now, what is the difference between an annuity vs a 401k? An annuity is a contract between you and a 3rd party where you make an exchange by making a lump sum payment and are provided with an income for a certain period of time (or for life), a death benefit, long term care benefits and growth on your assets. Both a 401k and an annuity has its separate advantages (read more about the pros and cons of annuities) but how does one convert a 401k to an annuity and what are its benefits? Now you’re thinking in the right direction and getting the hang of this! Let’s see what happens when you consider this type of retirement plan and make a list of all of the benefits. – Annuities allow you to have control over your savings. Rather than your employer or plan sponsor having direct control over your savings fund, the control is transferred to you. – The costs between an annuity vs a 401k is significant enough that it is important to take note. 401k costs usually range between 1%-2% but can go up as high as 2.5% or more! Depending on the type of annuity and options one adds, they can be significantly less than the employer-sponsored plan costs. – The majority of people will change employers throughout their life. With a 401k converted to an annuity, you are able to consolidate the multiple plans that you have with multiple employers. This making managing your money easier on your end as you can see all of your money in one place. – Rolling your 401k to an annuity also adds an extra level of protection. You are protected from market risk and longevity risk. Market risk is simply the risk that is part of the value of your investment in which it can decrease due to moves in the stock market. Longevity risk is important to consider because of how much life expectancy has increased. Annuities allow for a lifetime payout rather than worrying about running out of money in your 401k if you end up living longer than expected. – Annuities allow you to have risk certainty that cannot be matched anywhere else. In other words, market losses will not hurt your annuity savings. – Charitable gift annuities allow you to contribute to your charity of choice on a scheduled basis. These annuities also have the advantage of being low cost, pay you income over your lifetime and extra tax benefits while you are alive. Once you pass away, any money that remains will go to your designated charity of choice or your heirs. – When one passes away, you do not want your loved ones to have to go through probate to access the money. By rolling your 401k to an annuity, you pass this hoop as an annuity is transferred directly to your listed beneficiary. – The above benefits all come down to the most important factor. They all provide you and your family peace of mind. It is important to consider all of your options and sit down with a financial professional to weigh out the pros and cons of each option and use what benefits you. 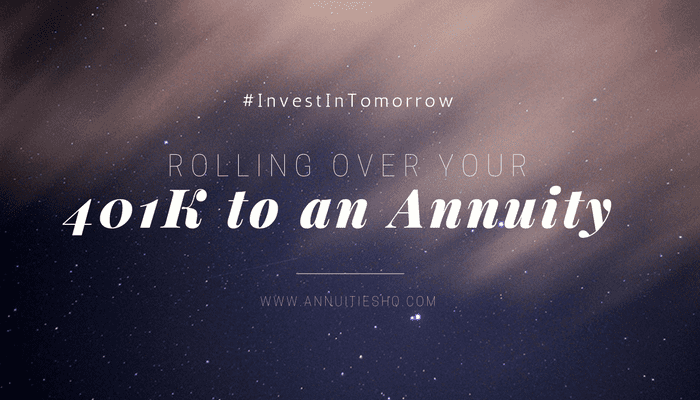 A 401k rollover to an annuity is a great start to a further look into the benefits of putting your money to work for you for retirement.